To dump you grey and black tanks on the off-chance that your macerator pump fails, begin by removing the extra support on your macerator. Depending on your model, this may be a simple jubilee clip (1), or a couple of screw through a metal strap. Once the support is removed, firmly grab the macerator and twist it counter-clockwise to disengage the bayonet connection (2), and slide the macerator off. To remove the macerator completely, you'll have to disconnect the electrical connection (3). 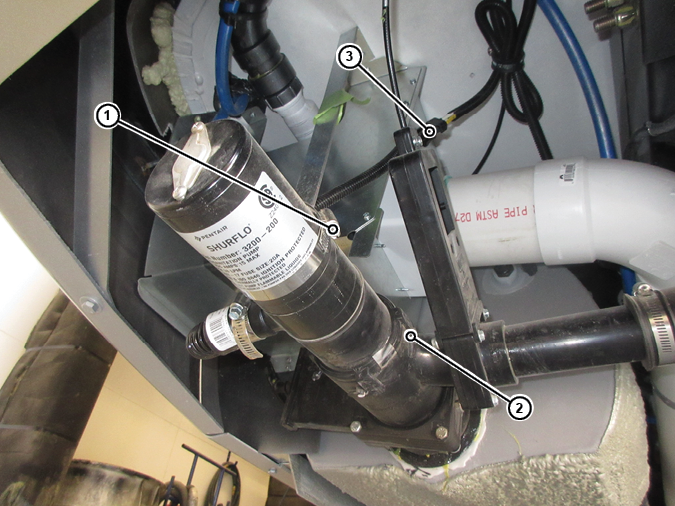 From this point, you can connect your regular dump hose to the drain and follow the procedure to dump your tanks without a macerator. Once the tanks have been dumped, reattach the macerator to be sure it's kept safe while travelling.